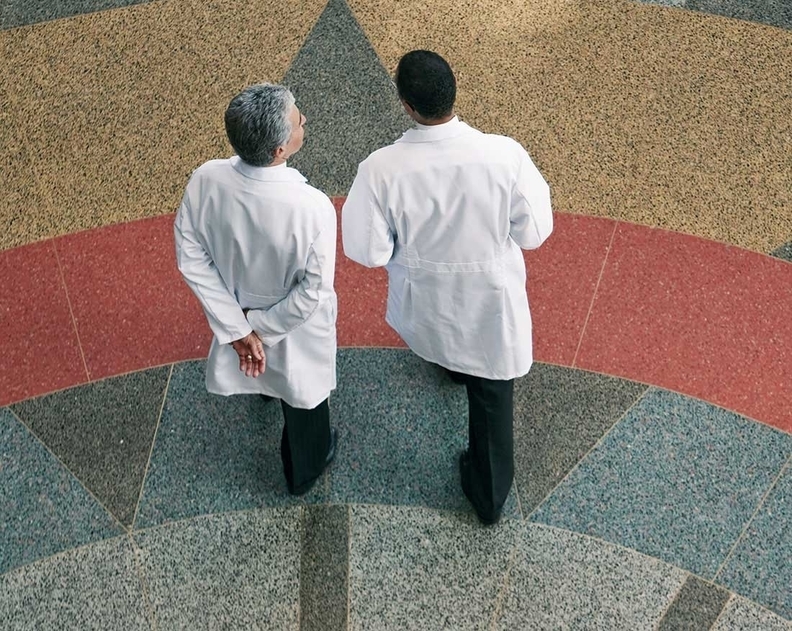 The new draft regulations designed to change how Medicare pays clinicians represent the most sweeping overhaul the CMS has made in a long time to the business of running a physician practice. The goal is to have the vast majority of CMS funding flow through payment models that reward doctors for the quality of care they deliver, not just how many patients they see. The changes have the potential to upend the way medicine is practiced today, accelerating the move toward hospital employment and making the small group practice a thing of the past. At the very least, the rule, once finalized, will inspire closer collaboration between doctors and hospitals, since physicians will have more incentives than ever to steer patients away from high-cost medical centers. The CMS' 962-page proposed rule is the first major step in hashing out the details of physician payment that Congress outlined in the Medicare Access and CHIP Reauthorization Act, the 2015 legislation that replaced the controversial sustainable growth-rate formula. In its attempt to move more physician payments through value-based arrangements, the CMS is combining three existing programs into a new Quality Payment Program. Clinicians will have to choose one of two paths: submit to the Merit-based Incentive Payment System (MIPS), or put a significant portion of their business into a qualifying Alternative Payment Model (APM). Both carry financial risk for failing to meet program goals. The potential impact on physicians' Medicare revenue under MIPS—which will apply to the vast majority of clinicians—would be as high as 4% in the first year, rising to 9% in subsequent years. The program goes into effect in 2019, but the first performance period begins on Jan. 1, 2017. Physicians have traded the perennial threat of Medicare pay cuts for a framework that gives them little choice but to adapt their practices to value-based care. Even though Medicare spending on inpatient services was nearly double the amount spent on physicians, according to 2014 data, the rule makes it clear that physicians will increasingly be the ones held accountable for keeping hospital expenditures in check. That contrasts with the old way of paying for medical services, in which the person or entity performing a service also controlled the revenue. Physicians are likely to respond by fleeing to hospital employment, large independent group practices or joint ventures with hospitals. “This will hasten the demise of the very small physician practice,” Muhlestein said. Another element of the rule that puts pressure on physicians is the transition from the current incentive program for meeting meaningful use of electronic health records to the CMS' broader Advancing Care Information program. The new requirements emphasize interoperability, information exchange and data security, creating some concern that doctors will need to invest in sophisticated information technology and analytics systems. The rule also came under criticism from the American Hospital Association for its narrow definition of an alternative payment model. The CMS exempted many of its current value-based payment models from qualifying as advanced APMs for the purposes of their exemption from MIPS. For instance, the rule excludes the Bundled Payments for Care Improvement initiative, as well as Track 1 of the Medicare Shared Savings Program, which delivers bonuses for meeting cost and quality targets but carries no downside risk. Ninety-five percent of the 433 accountable care organizations in the Shared Savings Program this year are in that track. APMs, the CMS said, must bear “more than nominal financial risk” in order to qualify. 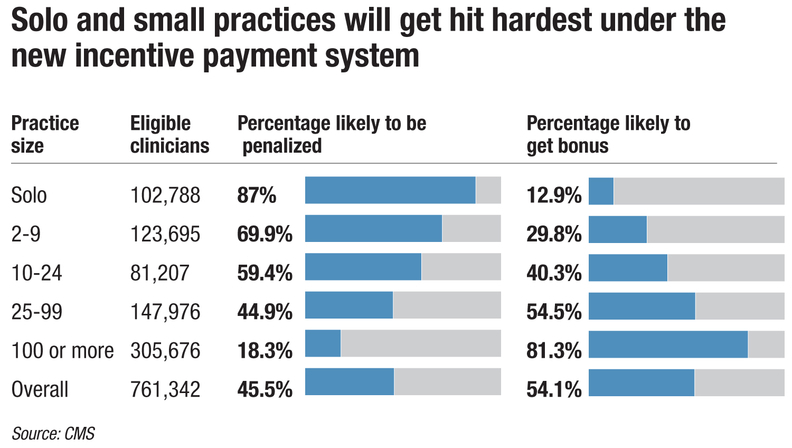 The incentive payment system, meanwhile, is designed to be budget-neutral, which means there will be winners and losers when it comes time to dole out payments. The CMS is forecasting that there could be $833 million in negative payment adjustments and $1.3 billion in positive payment adjustments, which includes $500 million in “exceptional performance” payments for the highest-scoring physicians. Under the framework the CMS laid out, it will be harder for physicians to tread the neutral middle ground. 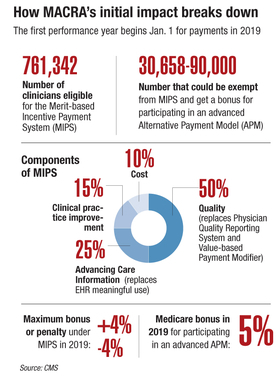 MIPS consolidates the Physician Quality Reporting System (PQRS), the Physician Value-based Payment Modifier and the EHR meaningful-use program—none of which was particularly popular. Under those programs, huge numbers of physicians swallowed Medicare pay cuts rather than submit the quality data necessary to avoid the cuts and possibly earn a bonus. For example, about 5,400 out of 13,800 physician groups eligible for the value-based payment modifier in 2016 took a 2% pay reduction because they failed to meet the reporting requirements. APMs also provide more flexibility for physicians who want to make investments that otherwise would not be covered, such as hiring care coordinators. But the CMS' strict eligibility standards for APMs mean that the only way for many practices to avoid MIPS would be through an accountable care organization. “An ACO is basically the approach that most providers are going to end up with,” Muhlestein said. Yet many of the APM deadlines are fast approaching. Applications for the Shared Savings Program, for instance, are due as soon as May 31. That doesn't give providers much lead time to prepare, Lee said. At the same time, a game of musical chairs will play out as physicians rush to find partners, either as a “virtual group”—a mechanism in the statute that allows small, independent groups to spread performance evaluation across a larger number of physicians—or through a more formal relationship.